I am une :: I am not concelealed :: I am not dull :: I am not artificial :: I am not superficial :: I am not indifferent :: I am not static :: I am une. Their main aim is to bring our the natural beauty of the wearer regardless of their skin tone. The products are designed to liven and enhance your complexion rather than smother it. They have created eco friendly packaging in order to minimise their impact on the environment. Sliding packs for products like eyeshadows are refillable and the materials used to create the packaging are recyclable. Most of their packs and products formulas are produced in Europe to minimise transport and environmental impact. All products are 98-100% natural and contain naturally sourced ingredients, are free from artificial colours, fragrances, GMO’s, petroleum derived ingredients, parabens and silicones. All ingredients are dermatologically or ophtalmologically tested. Each product on there website has a detailed product breakdown which shows you the ingredients and the percentage of natural and organic ingredients. I can’t wait to give these products a try, I think mascara and eye pencils will be first on my list. I adore organic beauty products and believe in taking responsibility for your health and the environment. 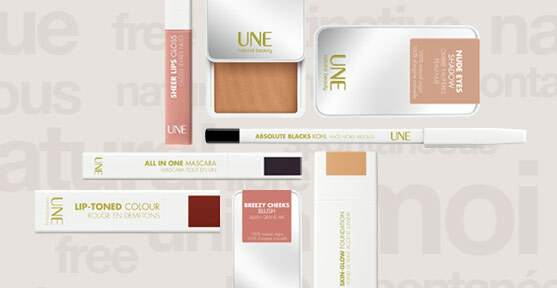 These products by Une looks great and I will have to give it a try. Thanks for the review.